Farley is a small Labrador Retriever who enjoys exploring in the Rocky Mountains. We try to get out on as many hikes and camping trips as we can. Having gear that will withstand various activities while serving an important purpose is essential to us. The Ultimate Trail Pack is marketed toward camping and hiking adventures that provides enough storage space to carry water and various dog supplies. The saddle bags are detachable, giving you the option to use the harness separately from the trail pack. The saddle bags also come in two size options, allowing users to choose the size that best fits their dog and the amount of gear their dog will be carrying. The Trail Pack is available in three size options based off of chest girth and a recommended dog weight. We tested the Medium pack, which fit Farley perfectly and seemed true to advertised size. The saddle bags are designed to hold up to 4 litres of volume, which is a large jump for the 1 litre limit for the size small pack. The saddle bags were proportionate and did not appear too big for Farley even though she was on the lower end for chest girth for the size medium harness. The saddle bags are easily removed and added to the harness by buckles, which made assembly easier than other trail packs that we’ve used. The bags do have a horizontal nylon strap to thread the chest buckles through in order to secure the packs closer to the body, although there was still quite a bit of movement with more vigorous activity. The one downfall to this is the need to unbuckle the harness to add or remove the saddle bags. We did notice that the harness does not have a chest plate. These are often used for comfort and support. This may not be the best option if your dog tends to pull while on leash, as it does put a lot of pressure on the neck. 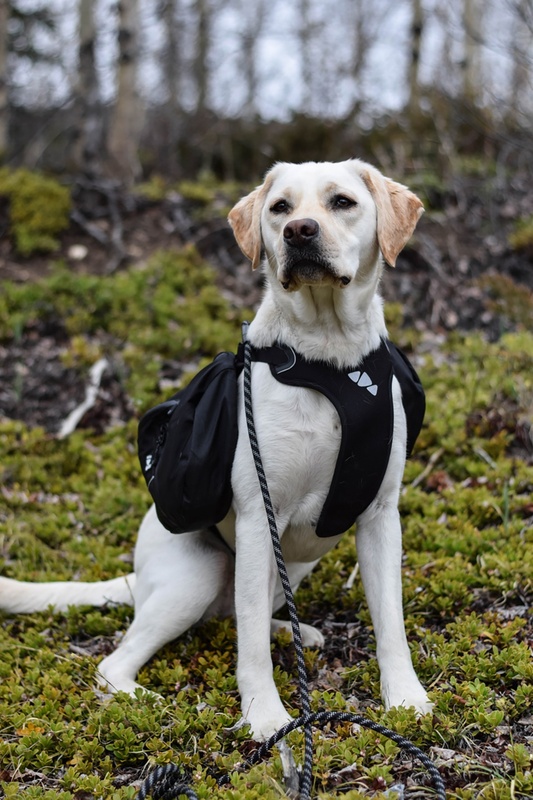 The neck strap was padded with a mesh and nylon covering, although it did twist quite frequently on our hike and needed frequent repositioning, There also wasn’t an adjustable strap which we would like to see to help keep the pack higher up on Farley’s back. The pack is made of soft, durable nylon and plastic buckles. The saddle bags held up well while brushing up against dirt, trees, and scree. The buckles appear to be strong and we haven’t had any issues with dirt altering their function. The bag has a few zippered pouches which are perfect for storing smaller items. One of our favourite details of this pack is the poop bag holder, making for easy access while out on the trail! The bag does have a couple of reflective piping locations and glow in the dark zipper pulls, although they were not very visible at night and I would recommend having another source of light for nigh time visibility. Except for the harness not having a chest plate, the material did feel quite thick durable. The handle also appeared sturdy. We did not complete a lift test as most harnesses are not intended to lift a dog, but rather provide support when needed. The pack is in the mid price point ($67.99), allowing it to be fairly affordable. The material is durable and should hold up to most adventures. While we do like the saddle bags and harness, I would likely pay a bit more for a pack that does have a chest plate for comfort and support. This Ultimate Trail Pack offers a harness with a great back and sturdy handle although unfortunately does not have a chest plate. The material and saddle bags are very durable and can hold an appropriate amount of items. If you are someone who plans to add and remove the saddle bags often throughout your adventures, this pack could be a bit of a time consuming task for you. View the Ultimate Trail Pack. 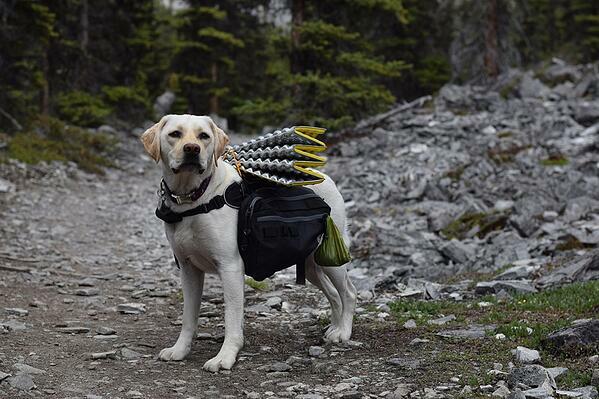 The Hurtta Trail Pack is designed for hiking, trekking and travelling with your dog. The saddle bags are detachable, allowing you to use the harness separate from the trail pack. Hurtta also offers two size options, allowing users to choose a size that will fit their dog the best and being able to carry an appropriately sized load. The pack only comes in two size options, making it quite difficult for smaller or larger breed dogs to find the right fit. Farley was in the middle of the size range for the small pack and we had no issues with the fit of the pack. The smallest saddle bags hold a 4 litre capacity while the medium holds a much larger load at 10 litres.. The saddle bags attach to the harness with plastic keyhole clips which do hold the bags in place and close to the body without any movement while on the trail. By having this type of attachment point, the saddle bags are easily added or removed without removing or unbuckling the harness. We do wish the nylon straps were 1” wide, although with their size range, this would be too big for smaller dogs. The harness offers three adjustable body straps and an adjustable neck strap, allowing the harness to be tailored perfectly to any dog within the size range. Once adjusted to Farley properly, we didn’t have any issues with the pack favouring one side or the harness shifting with movement. We also had no issues with chaffing even when used for multiple hours. The harness is made of a thinner fabric lined with a mesh-like material and plastic buckles. While the chest plate provides a fair amount of support, the back of the harness could benefit from being less pliable. harness offers 3M reflectors on the chest plate and the saddle bags each have a small reflective horizontal line. While providing some visibility, we still recommend another source of night time visibility. There is a thin nylon handle to help guide your dog, although the bag could benefit from a wider and more stable handle. The harness also includes two leash clip options, allowing you to use the one that works best for your dog. The Hurtta Trail Pack is on the higher end of dog packs ($106.99). We do believe that if your dog fits within the size charts, then it is a great option if youre willing to spend the extra money. The quick detachable saddle bags and properly designed harness make the trail pack worth the cost. Hurtta did a great job designing the trail pack. It has great features that other packs don’t offer, such as the keyhole attachments for the saddle bags to eliminate the need to unclip the harness to remove the bags. The bags are proportionate to the dog and is made of durable material. We do however wish they would broaden their size chart to help tiny and large dogs fit their packs. View the Hurtta Trail Pack. The Baxter Pack is advertised for avid hikers and adventure dogs, being made of durable materials to withstand outdoor activities. The saddle bags are not removable, requiring to use the entire pack with each use. A unique and convenient feature that Kurgo offers is a bottle opener that is attached to the pack! The Baxter Pack comes in two size options, which can make it difficult to properly fit to some dogs. The recommended minimum dog weight for the smallest size is 30lbs, eliminating many dogs from being able to use the pack. Farley fit the small size based on measurements and weight. Although the harness fit well, the saddle bags appeared very small against her body. The small pack offers 3.5 litre bags, while the large can hold 7.5 litres. 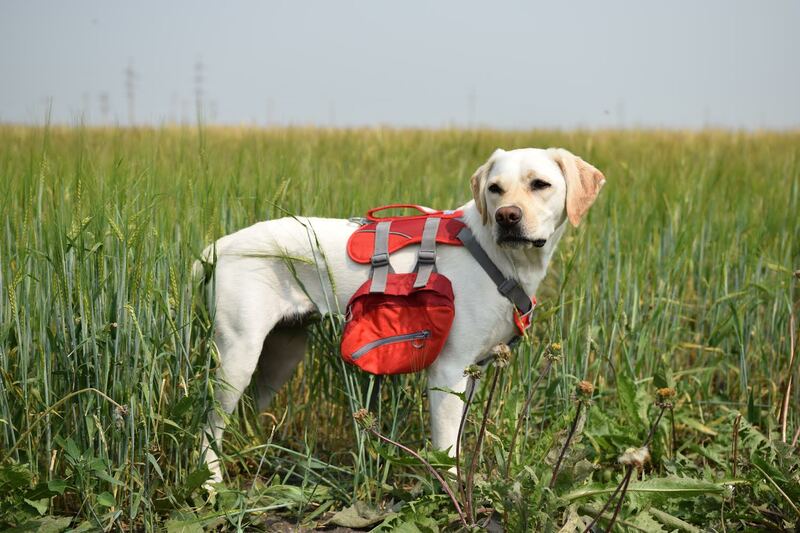 The Baxter Pack is different than the other two packs, as the saddle bags are not removable, but rather adjustable to help position them appropriately on your dog. For smaller dogs, you are able to pull the bags closer to the harness, or lengthen the nylon straps to lower the bags on larger dogs. Although there are downfalls to not being able to remove the saddle bags, one of the benefits are that the bags do not move at all during activity. Despite Farley running with her friends through the woods, the bags did not move at all. While the harness doesn’t offer a full chest piece, it does offer a 3-point attachment piece on the chest for comfort and support. The back of the harness is thick and sturdy and has an attached handle for guidance. There are eight adjustment points on the harness, allowing it to be tailored to your own dog. Once again, we did not experience any chaffing during use. The pack is made of slightly thinner fabric than the other two packs, but is advertised as being durable. It is offered in three colour options, allowing you to choose a colour that suits your dog best. There are several nylon straps and plastic buckles on the harness that have held up to our outdoor adventures. As mentioned above, the fabric did hold up while Farley was running near branches and with her dog friends. While we haven’t had any issues with quality, our friend’s dog managed to snag her pack and tear a small hole in the saddle bag. That being said, Kurgo does offer great customer service and did fix the problem immediately. The pack also offers a metal leash attachment point, creating a strong and secure connection. The handle and the back of the harness are both lined with reflective strips for night time visibility, which is similar to the other two packs. The Baxter Pack is the cheapest of the three packs ($45.59), although is a great beginner pack for your dog at a great price! The smaller saddle bags, sturdy harness, and light weight, are great features for your dog to become accustomed to a pack. The saddle bags are not removable, eliminating the option to use the harness separately for daily use. Kurgo did great designing this beginner pack for dogs. They are the only company that provides a unique feature of a bottle opener attached to the pack. The saddle bags are unfortunately not detachable, making it impossible to use the pack as a harness on its own. The Baxter Pack gives owners the opportunity to try a pack on their dog without dishing out a lot of money. If you are hoping to get your dog a trail pack but are unsure if they will like it or do well carrying items, this is the pack for you! View the Kurgo Baxter Pack.